You may have noticed I've been pretty busy lately sewing smallish projects and designing new pdf patterns. That's where my passion seems to be leading me these days and you know what? As of this Monday I'm trying to make this sewing obsession of mine a full time job. Eeeek! So, so very excited (and of course a little nervous) about this whole thing :). 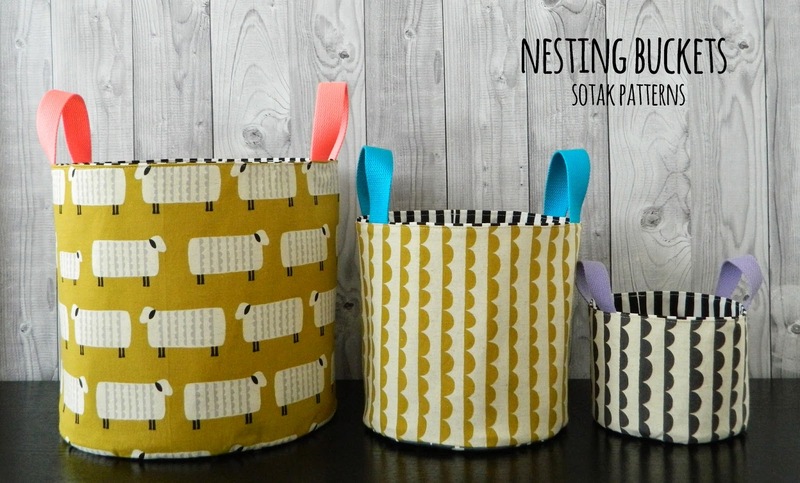 And so today I'm really happy to be able to show you my newest pdf pattern for Nesting Buckets. I love this project. I truly do. I think these buckets are super useful as we all have tons of toys, craft supplies, ... that need to be organized and contained. What I like even more about them is how stylish they look. I love having storage buckets that are pretty enough to be displayed around the house instead of having to be shoved in the back of our closets. I used beautiful cotton/ linen blend by Ellen Luckett Baker called Charms for exterior of my buckets. They come in three sizes (small – 5” tall, 6” diameter; medium – 9” tall, 9” diameter; large – 12” tall, 12” diameter) and they each could be made with or without handles. I'm already thinking of making a few more small ones to hold my thread :). Here's another version of a large bucket using gorgeous canvas by Skinny laMinx for Cloud 9. Totally makes my kids' stuffed toys look less of a mess and more of a design element :). You can purchase an instant download pdf pattern for these buckets by clicking on the link below, or by going to my etsy shop. I'm offering this pattern at introductory $5.00 for the next 48 hours. Oh, and for those who asked yesterday about my Skopelos bag. Yes, the pattern is in the works and I hope to have it ready in about a week or two :). Very fun! Wishing you the very best in your endeavor! adorable projects, especially love the canvas large bucket. Good for you following your passion. Ano, tyhle boxy jsou maximalne uzitecne, mam je moc rada. Krasna prace, Svetlanko! Please--let's not make everything small! I ordered your bucket pattern--good price was a big incentive--but I want quilts or wall hangings. I suggest you sell fabric and consider paper patterns. Except for this bucket pattern I have decided not to purchase PDF patterns anymore. They are cumbersome to print, and awkward to store. Please consider paper. I will gladly pay more for them for the convenience. Can you tell me what that black stripe fabric is? Love this pattern. Good luck with your new endeavor!! What supplies do you use to make it sturdy? What sewing level is this? Is it hard to sew the circles? Thanks! It's a beginner friendly pattern and I used Pellon Decor Bond to make these buckets nice and sturdy. Oh my goodness, that sheep fabric is so cute!! Awesome pattern, you're coming up with some great new patterns. Looking forward to what you have coming next! Stacking things are so useful and the large one is a great way to a a pop of color to a room! Congrats! Also...where you purchase your strapping for the handles. Love the colors! These looK amazing Svetlana! I love the size and the fabrics you've used! These are adorable! I love the stripes inside each bucket. As always, your fabric combinations are spot on! Your fabric choices are always so fun as well as your color/pattern combinations! You always make the BEST fabric choices, and pieces with such clean, chic lines. I'm so excited for your new venture and happy to begin supporting you by buying the pattern! And I really appreciate the PDF option - I live in France, so it's too expensive for me to pay shipping for things from the States. If you only offered paper patterns, I wouldn't be able to buy! I really appreciate being able to participate "back home" even though I'm far away. How cute is that photo of the stuffed animals in the bucket??!!! I'd wish you good luck on your career path but you don't need it! I know you'll be successful!!!!! !